Local planar dendritic structure: a uniquely biological phenomenon? Dendrites of different neurons have their own characteristic structures . Global planar structures have been observed in Purkinje cells and retinal ganglion cells. Further, local planar dendritic structures have been discovered in the pyramidal neurons of the rabbit visual cortex . Given an enclosing bundle of parallel fibers, the global planar dendritic structures of Purkinje cells can be explained as a minimization of total dendritic and path lengths (from synapses to soma) . We investigated whether a similar minimization approach can explain local dendritic structures and conducted two types of Monte Carlo simulation studies of local dendritic angles. In the first study, the coordinates for each point were determined at random from a uniform distribution and then the resulting points were connected randomly. 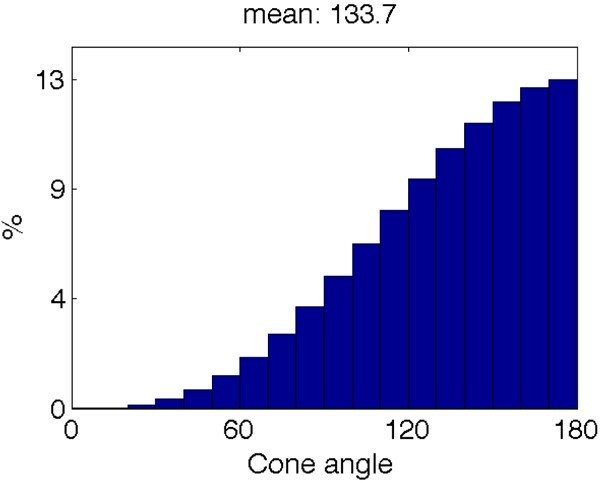 The mean of resulting cone angles was close to 90 degrees (Figure 1). In the second study, randomly chosen points were connected to minimize the local connection length. Interestingly, the resulting cone angle distribution had its peak close to 180 degrees (Figure 2), implying that the local planar structures observed in the biological system  can be obtained by minimization of local connection length. Furthermore, we discovered that essentially the same distribution of local dendritic angles as the one in Figure 2 could be achieved when a parent point located at the center of the sphere branches uniformly to the local area. This is due to the fact that there is a higher probability of sampling coordinates that result in wide angles. Hence, previously suggested mechanisms for local planar structure, such as tension or forced equilibria between the parent and daughter segments , should be revisited under the naturally occurring distribution (Figure 2). Besides, the finding that most neuron types indeed have local planar structures further supports our result. Monte Carlo random sampling of 4 points in space. The cone angle between a parent and two children branches is depicted. Monte Carlo simulation of 4 points with optimization on local connection lengths.